After I got Ruud Verkerk’s Play that record compilation (of records-about-records), I got the idea to make a Dutch compilation for him. That was a brilliant idea, and I should have left it that. But I was so stupid to actually try and make it. I spend two nights going through my record collection and recording every thing that sounded interesting enough. But there was not much that really excited me and somehow it didn’t work. 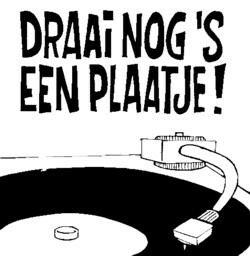 Records-about-records seem to be far more interesting when they are made outside of Holland. Sometimes you start making a compilation with no idea at all and it works out perfect: all songs seem to blend together and make the whole more than the sum of it’s elements. But this time it felt like the opposite: the compilation was dead as a doornail, and nothing that I tried could bring it alive. The songs were of too many different era’s (from 1900 to 2000); there was too much spoken word that was not interesting or even plain stupid; and there were too little songs. My favourite track on the CD comes from a CD by Ed van Hooijdonk. It is a CD with all kind of jingles and sound effects, which he had used for his productions. 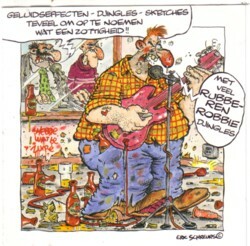 He is most famous for his Rubberen Robbie project, but he did many other interesting projects too.I will write about Ed van Hooijdonk and the music he produced later in this blog. Here is Plaatopname .